With colleagues I’ve been analysing English Census data from 2001 and 2011 and I was shocked to see how limited our ‘cycling revolution’ is. I thought places with increases in cycling would see some increased diversity among cyclists. This turns out to be wrong. The gender balance of cycle commuting in Inner London has barely shifted and the age balance has tilted further towards the young. The data suggest even where cycling is rising, cycling conditions still disproportionately exclude women, older and disabled people. Rises in cycling are also skewed towards richer areas. It's as if we’ve still been building cycle routes aimed at a minority of adults who are younger, middle-class, able-bodied, fit, and male. Ironically those tend to be groups with good access to alternative modes (e.g. cars) and less need of cycling’s health benefits than those excluded. So I would argue for inclusive design for equity reasons, but also, it’s the only way we will ever achieve mass cycling, with all the associated benefits for our city. And first this means space for cycling, away from fast or heavy motor traffic (although of course, not only that). I think alongside the other laudable objectives of the West End Project, building for mass, inclusive cycling needs to be an explicit priority. Neither TCR nor Gower will provide safe and inviting cycling under the current plans. 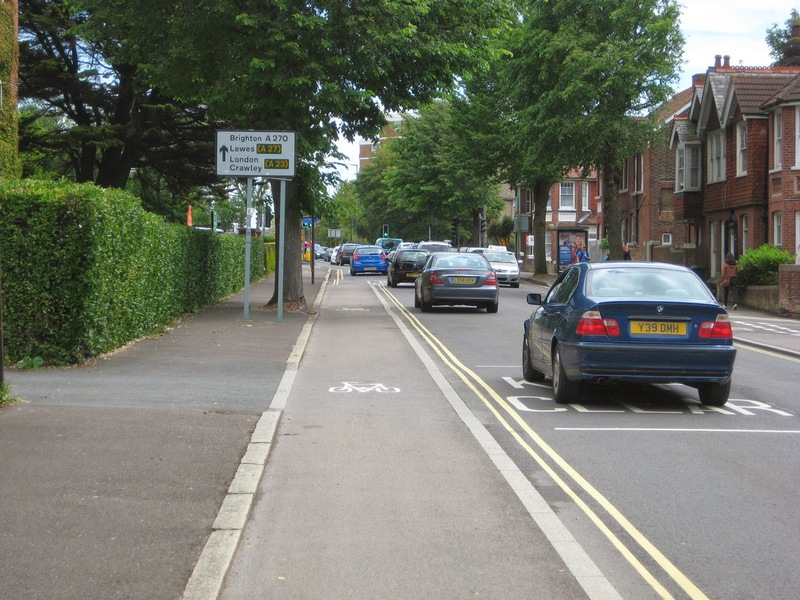 Ways of getting there are (a) high-quality segregated infrastructure or (b) filtering to very low levels of motor traffic. My suggested compromise is (b) on Gower Street (close it to through motor traffic) while retaining bus priority on TCR. But if that’s not on offer, I’d want proper segregation from high volumes of buses or other motors, the approach the Vole argues for. Both have pluses and minuses, but I note that Vole’s and my plans both involve reducing and restricting private motor traffic. They don’t hit other sustainable modes to boost cycling, but offer more radically liveable solutions. And a contribution to the debate on the As Easy As Riding A Bike blog Designing for existing mode share puts the general question that Camden's whole approach here begs: should existing flows of various types of traffic be allowed to constrain designs so that we cannot redesign to accommodate a new balance of traffic which would be preferable for many environmental, economic and health reasons? In other words, because lots of people travel by bus, private car and taxi here now, should we say "We have insufficient space for proper cycle tracks because we have to accommodate these existing flows, or something very close to them, in the redesign", thus falling into an apparently self-prepetuating trap of being unable to in practice alter which modes we prioritise? 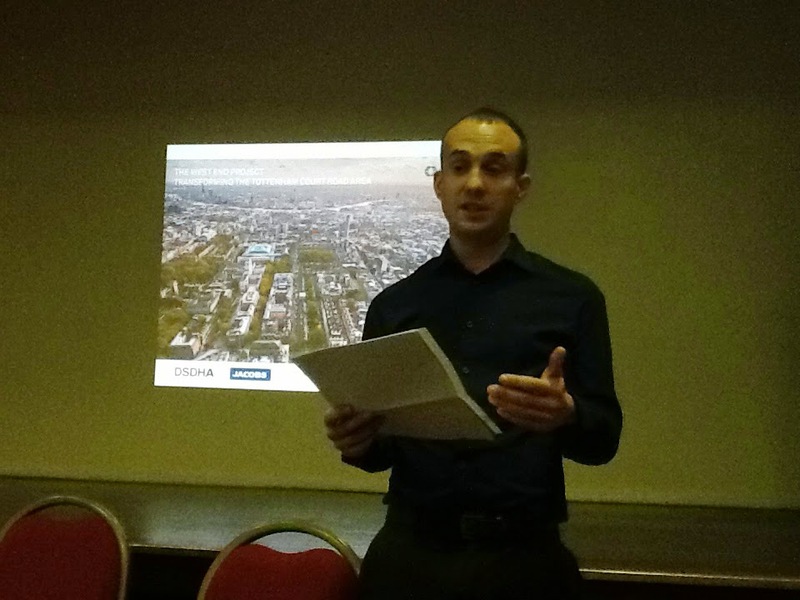 On Wednesday 2 July Camden Cyclists held a public meeting at which the arguments were aired. Cllr Phil Jones of Camden Council introduced the scheme, which was then, however, largely explained and defended by two of his officers. The most telling moment for me came when one audience member, a woman, stated that she was not a cyclist, that she found London's roads too terrifying, that she wouldn't cycle on Tottenham Court Road amongst the heavy flows of buses as proposed, and that Camden's scheme whole not encourage her to cycle. A well-known LCC member then pointed out that the road would have a 20mph limit, and asked her how slow the buses would have to go for her to feel safe cycling with them: a question that I thought spectacularly missed the point of what she was saying, accurately representing how most non-cyclists feel about sharing road space with big vehicles. A fellow campaigner who was present at the meeting has written a letter to Cllr Phil Jones, which I think points up the core issues very well, and, with his permission, I am publishing it anonymously here, as it deserves wider circulation. Thanks for coming to present the West End Project to us last Monday. I noticed, as you and [Camden officer] were describing the design process, that there's a persistent lack of consistency between your stated policy, and the way you have been making design choices – and I think this means you're ending up with a project that's much less good than it could be. I thought it might be useful to clarify where the problem lies, and how it might be corrected. Reduce motor traffic levels and vehicle emissions to improve air quality, mitigate climate change and contribute to making Camden a ‘low carbon and low waste borough’. Encourage healthy and sustainable travel choices by prioritising walking, cycling and public transport in Camden. Improve road safety and personal security for people travelling in Camden. This is a great policy. Its underlying intuition is that people have a choice of transport modes, and that making certain modes easier to use than others will affect those choices. It recognises that allowing people to make better transport choices by making some choices relatively easier has significant both individual and social benefits, in terms of public health, pollution, congestion, severance, road safety etc. It also recognizes that design can (and should) lead user choices. When you, John, and Sam described the various options you'd considered for the West End Project, and your reasons for rejecting them however, you appeared to be working with a model that assumes everyone is locked into their existing choices, and has no possibility of changing them. (I think this is because your only quantified information here comes from a TFL traffic flow model that takes no account of user choices) This, in turn, seems to be forcing you to make design choices that lead you to, essentially, rearrange the status quo – and lose all the benefits that could come from allowing users a better set of choices. The only way your policy of 'prioritising walking and cycling' can be properly incorporated in design decisions is if you actually attempt quantify the benefits it can give, and make the decisions on that basis. So, for example, rather than saying, 'we can't build an inclusive cycle route because it would involve unacceptable cuts to motor traffic', you might want to say 'we estimate that an inclusive cycle route here will promote significant modal shift and attract 20,000 cyclists a day, and will have such and such health/environmental/congestion/road safety benefits' - and 'we won't be able to allow private motor traffic here because we need to prioritise cycling to get these benefits'. etc. Part of the process of quantifying the benefits of removing barriers to active travel will be an attempt to forecast (and target) usage. This can't be just a matter of 'build something and see' – in part because usage is endogenous. If you build very high-quality cycle tracks, many more people will use them. A starting point should be the Mayor's target of 400% increase by 2026 – but I suspect the many existing barriers to cycling on this route are suppressing demand sharply, and it would be good to engineer for at least twice that. It would also be good to know the demand for cycling to school. I think it would be useful at this point to return to the main options that were considered, and re-work the assessment process according to Camden's own policy, using a model that allows for users choices (and the possibility of improving those choices) – and attempts to quantify, within each scheme, the real gains from traffic reduction and modal shift (as well as, if you like, whatever real gains from two-way working, and running two-way buses on one street). It would also be useful to re-think the narrative you're giving to stakeholders. 'Giving better choices to all, for a better environment for all' is a better aim 'than 'balancing the needs of all user groups', which assumes people don't make choices, and leads you back to the status quo. Because high-quality cycle routes need to have a consistent standard from beginning to end, and bus routes need to be logical, it would also be useful to have in hand at least an idea of how the rest of Camden should look in the future - where the bikes should go, where the buses should go, where the private motor vehicles should go. To get the West End Project right, we need to know approximately what we will want to do at Holborn, and on and around the High St, in particular. I realise this is a lot of work - but given this is a £30 million scheme in the heart of London, (and that, once that money is in Camden's account, it's public money) it seems to me that we should ensure that it's spent for the maximum possible public benefit. 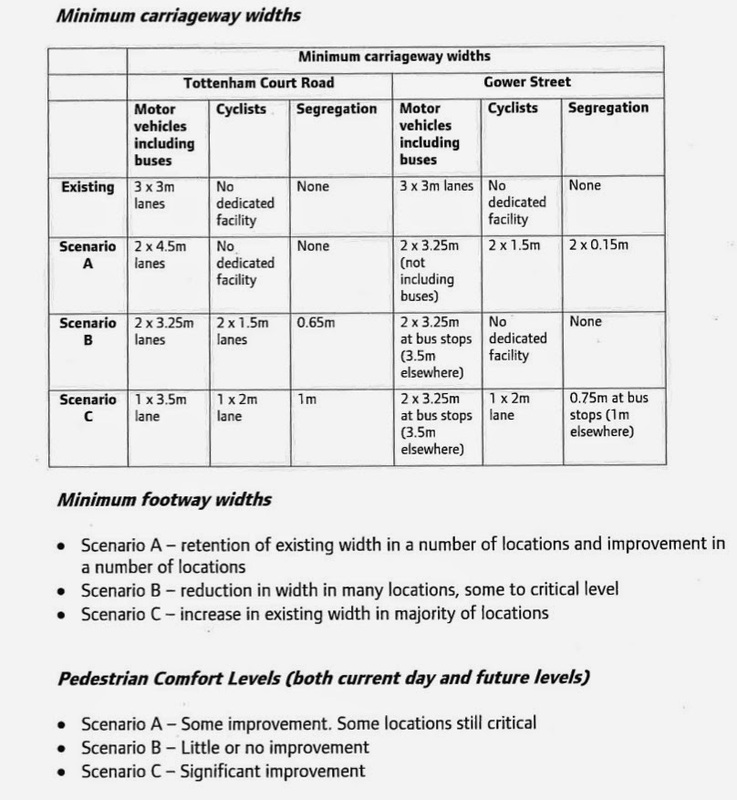 I know there has at least been a start in forecasting and quantifiying the benefits of increased walking – someone did this for the Cobden Junction scheme. In terms of cycling I know the TFL cycle superhighways team has done some work on both estimating demand and making a business case – perhaps they could be asked to help out? To prioritise pedestrians, one could remove all motor traffic from Tottenham Court Road. This would reduce pollution, motor traffic danger, and the obstacle of crossing the road. It would also hugely benefit business, by transforming TCR from a 'route' into a 'place. To prioritise cyclists, one could make TCR a pedestrian and cycle through-route. Cyclists don't pose the same danger to pedestrians as motor traffic, they don't get in the way of my place-making, and they'll benefit from a safe, high-capacity north-south route. One could also close Torrington Place/Tavistock to through traffic to make a safe east/west route. To prioritise buses, one could make Gower St buses only. It migh be useful to widen the pavements to accommodate more people waiting for buses. So here, we've prioritised modes as Camden suggest - and it turns out there's plenty of space for buses, bikes and pedestrians to co-exist. Now we can add in delivery and services, at off-peak hours so as not to delay buses. Finally, there's taxis and private cars. If we can let some on, for access only, that's great. In terms of access further south, for now, that's via Woburn Place. We end up with one N-S route with high/quality bike/pedestrian priority, one N-S route with bus/pedestrian priority and one N-S route with private vehicle priority. That seems to reflect Camden's priorities at least a little better than the current design. If you prioritise walking, cycling, and public transport here, there's plenty of room for all three, without conflict. It's when you bring in private motor traffic/taxis as well that there begins to be a conflict with buses. So, as in many places elsewhere, the supposed bus/cycle conflict only exists if private motor traffic has priority. If you bring Woburn Place into the mix, the balance of modes looks very different. Does south Camden need more than one main N-S route for private motor vehicles? Thanks again for taking the time to come to talk to us. As the meeting with Phil Jones went on, I personally became more and more convinced the West End Project is actually a bus priority scheme with some minor walking and cycling improvements tacked on around the edges. There was, as the letter above states, a disconnect between the stated hierarchy and the actual proposals, and a failure to try to model or estimate what the effects of proper cycle infrastructure would actually be on the balance of modes that the streets needed to accommodate. We heard a lot about "massive bus use", but had no information about the average length of those bus trips, so no idea of how many of them would be highly cycleable if conditions for cycling were optimised. Similarly, there was a lot of talk about the need for expanded pedestrian space due to the opening of the Crossrail Station at Tottenham Court Road, but no recognition of the fact that these pedestrians might not need to be delivered by train, many of them might be able to cycle in when (and if) The Mayor's Vision for Cycling really starts to take hold and we have a network of high-quality routes in Central London and beyond. Then the need for pedestrian space versus bike space would look different. Forcing people to use trains and buses because the cycling alternative is so poor is not very environmental. On the subect of buses, again, there was a contradiction between what the officer said about the huge, and expected increase, uptake of bus travel, and the fact that he claimed the "system was not working for bus users", because of the need to catch north and south-bound buses from different, closely-adjacent streets. I just can't see this. If such large numbers of people are using buses here, they are not being put off by having to walk a few yards to the next street, and I can't see why they should be in general. There are loads of other places in London where bus routing in opposite directions is on different strteets. On the other hand, people are certainly not cycling here in "huge" numbers. People, like the woman we heard from at the meeting, really are being put off from cycling in a massive way by the cycling system, that "just doesn't work" for them. So very different standards of service are being applied to the bus mode and the cycling mode. This is clearly discriminatory, and linked both to the majority/minority status of these modes, and also, I suspect, subliminally, to the way that cycling is perceived as a sporty, athletic activity for tough people who can be expected to put up with a lot of obstacles thrown in their way, while bus use is perceived, in the usual British paradigm, by contrast as being universal and democratic. There is no thinking on how your 80-year old aunty might be expected to cycle on a Boris Bike up Tottenham Court Road. We also found out there are severe objections on practicality grounds to Camden's scheme. There will be general motor traffic on sections of Tottenham Court Road during the hours of operation of the restrictions, 8am–7pm Monday to Saturday, making E–W journeys, connecting between side-streets, and it will flow at a different time to the bus and cycle N–S traffic on the road because of the phasing of signals. But there will be nothing to physically force that traffic to turn off where it should. There might, we were told, be louvred signs, that change their aspect between "No entry" and something else depending on the time of day. But nothing will physically force general traffic to make those turns off Tottenham Court Road road, and not to continue up it. There was talk of enforcement cameras. But one still wonders how enforceable all this is going to be, as only a part-time scheme. Another option that was thrown into the mix at the meeting by Camden Cyclists was the possibility of essential doing the Camden scheme, but having segregation on Gower Street for cycling on both sides in the style of Brighton's Old Shoreham Road (or indeed most main streets in Copenhagen), that is, using half-height cycle tracks with a step up from the road and a step up to the pavement. This would make slightly better use of space than the armadillos proposed by Camden, but I think there isn't much in it really. I still think the pressure for stopping of taxis and delivery vehicles on this space will be overwhelming, and that this form of segregation will be too weak, and will get obstructed in this loction. In any case, there is no way that as much dedicated space for cycling can be made using this basic model, of a two-way Gower Street and TCR, as can be made under my one-way model, as I've taken out more general traffic space. – a claim continually made by Phi Jones and other proponents of the scheme as well at the meeting, that there is some property of two-way streets that makes them automatically better for all than one-way streets, I ask for the evidence. I claim that if you look at how things are done elsewhere, you find you can do one-way streets just as badly, or just as well, as two-way streets. Similar claims for how much better Piccadilly would be were made before its conversion to two-way working. The reality proved totally different. Mark Ames, in the same post, also rather implies that those who are asking for a better scheme for cycling than the one Camden is offering are too cycle-focused and not properly considering the needs of pedestrians, or not thinking enough about the demands that the Crossrail station is going to make. Well, I'd like to draw attention to the following facts. Quite independently of all of us, the Greater London Authority has studied the various options, and, in documents I and other LCC members have seen, and an extract from which which I reproduce here in public for the first time, The GLA's transport experts have concluded that Camden's favoured scheme is not the best for pedestrians. The GLA analysis was presented in a meeting at Camden's offices that included London's Deputy Mayor for Transport Isabel Dedring, senior officers of the GLA, Cllr Phil Jones, plus Camden and TfL officers. It makes clear that Camden are significantly at odds with the GLA (and possibly TfL) over this scheme, and that the GLA is trying to do something better for both cycling and walking, which Camden is resisting. I am not sure why Camden have taken this line, but this is important background to know for those considering whether to basically support the Camden plan, with maybe small modifications, as the semi-supporters suggest, or to basically oppose it, and demand something quite different, as I and Rachel Aldred suggest. This is why I have taken the step of publishing the extract from the briefing above. It seems to me, if anybody is not really considering properly pedestrian needs and the implications of the opening of the Crossrail station, it is Phil Jones and the supporters of Camden's part-time scheme. For, as I pointed out in the meeting, they are proposing, between the hours of 7.00 in the evening and 8.00 in the morning, and and all day Sunday, the opening up a whole new route to the heart of the West End for unrestricted general motor traffic from the north side of London, on the biggest roads, via Hampstead Road and Tottenham Court Road – a route that does not exist now. This route will be in operation during the evening, when the West End throngs with restaurant, cinema, club and theatre goers. It will bering this new stream of traffic right down Tottenham Court Road, bang into the space at St Giles Circus where the new station opens out, bang into collision with all the pedestrian, cycle and bus activity that will be there. To me, this seems crackers. Who has lobbied for it, I'd like to know? Who is Camden actually listening to? In whose interests is this new access stream for general traffic in the evenings and on Sundays down to St Giles Circus? For all its faults, this is one problem that even the current traffic system does not create. The consultation is now open until 1 August.